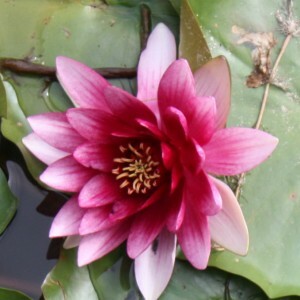 Nymphaea is the well-known grassy perennial plant widespread in different corners of the globe. There are about 50 types of this perennial. Leaves of this plant differ in the unusual roundish or heart-shaped form, and large flower asterisks or flower cups are noticeable still from a distance thanks to the motley color. Blue simple or terry flowers meet snow-white, cream, yellow, orange, red and even! Root system of nymphaea is very big, but roots, though seem strong, actually gentle. That not to damage them, it is necessary to add small pebble or sand to soil. Nymphaeas are surprising also because grow in standing or slowly current waters. At one types of water-lilies flowers blossom in the afternoon, at others – at night. Quite often blossomed flowers publish gentle aroma.